Posting here links to two interviews with Julia Nail Moss, Sam Nail's daughter. The first is from UT San Antonio, the second from UT El Paso. Both links can be used as a starting point to search their respective oral history databases. Nice Flash! Thanks for sharing this. Thanks, Flash! Perfect timing. Just what I needed. Your historical sleuthing powers always amaze me. Thanks Flash. Interesting reads but the first one the interviewers are pretty lame and not sure why they were interviewing her as they really didn't seem to know much about Big Bend. Thanks Flash. Interesting reads but the first one the interviewer are pretty lame and not sure why they were interviewing her as they really didn't seem to know much about Big Bend. Agreed. Found myself skipping ahead through all the noise and skimming for the facts. Preferred the second one myself. The more I read about the region, the more frustrated I become w/ the park service's decision to remove all the signs of human habitation. What a waste and disservice! Well, the NPS is the self-appointed expert on matters of preservation and conservation. Just ask them. Unfortunately, their "expertise" in such matters is not borne out by the reality of their actions. They don't walk the talk. Consider it sheer luck that they did not erase all of the ranching/historic use in their never-ending zeal to recreate an idyllic image of something that never was. Since what the NPS IS expert at is entertaining tourists, I am perplexed that Big Bend does not have a golf course like Death Valley NP does. After all, what is more appropriate for tourist entertainment in a national park than an obscenely green, artificial oasis in the middle of any desert (and the hottest/driest one in the US at Death Valley). GOLF! It does a National Park good. So sensible. So attuned to the needs of tourists. Undoubtedly, a world class golf course still could be built in the Basin. Think of how challenging it would be and the crowds it would draw to test themselves on a supremely difficult course in an unparalleled setting. Golfers would not be allowed to drive into the Basin, so as to not unduly affect the other tourists who are there for different entertainment venues. Golfers would ride the new chair lift that would follow the power line up Green Gulch. Golfers would pay any green fee the NPS decided to charge (just look at what green fees are these days). Heck, they might make enough money off of golfers to stop nickle-and-diming the rest of us to death. Everybody wins and it would be "par" for the agency. One thing the 1994 interview mentions (p. 8 ) is that the route taken from the Nail Place to Marathon was northward through Slick Rock. This route was also mentioned in Woodie Guthrie's tall tale Seeds of Man. Good find Flash. You can see the route on the old 1931 topo and even some remnants on Google Earth today. Thanks. There was discussion in another thread about what "Slick Rock Gap" might mean vs. "Slickrock Canyon", etc. 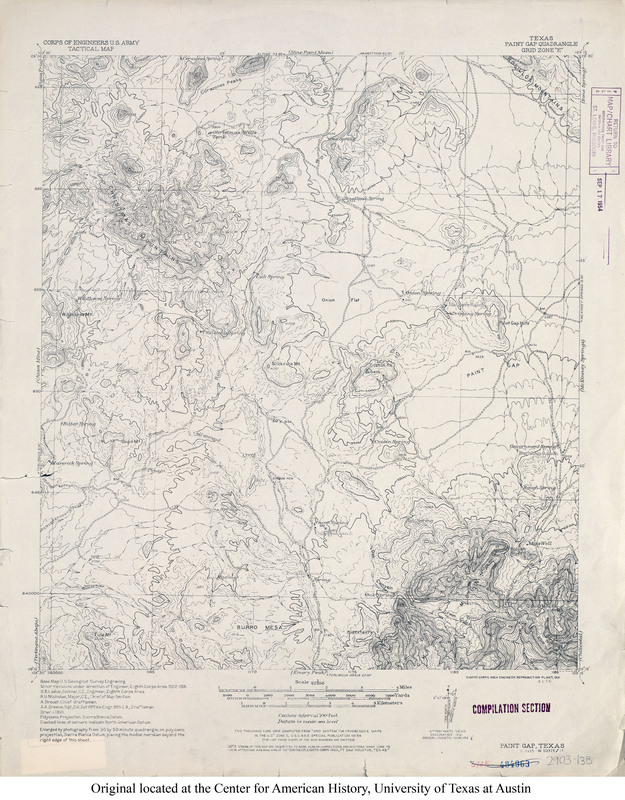 I might speculate from the 1931 map that the gap and the canyon could be considered two separate things, i.e. "Slick Rock Gap" may be the route the road follows between Slickrock Mountain and Croton Peak leading northward to Onion Flat. I would agree with that. “Slick Rock Gap” would be where the road went. Nice to hear her actually pronounce the place and people names such as Study Butte, Marathon, Buttrill, etc. Great to hear her strong voice, when I read the transcripts it made her sound old and feeble.